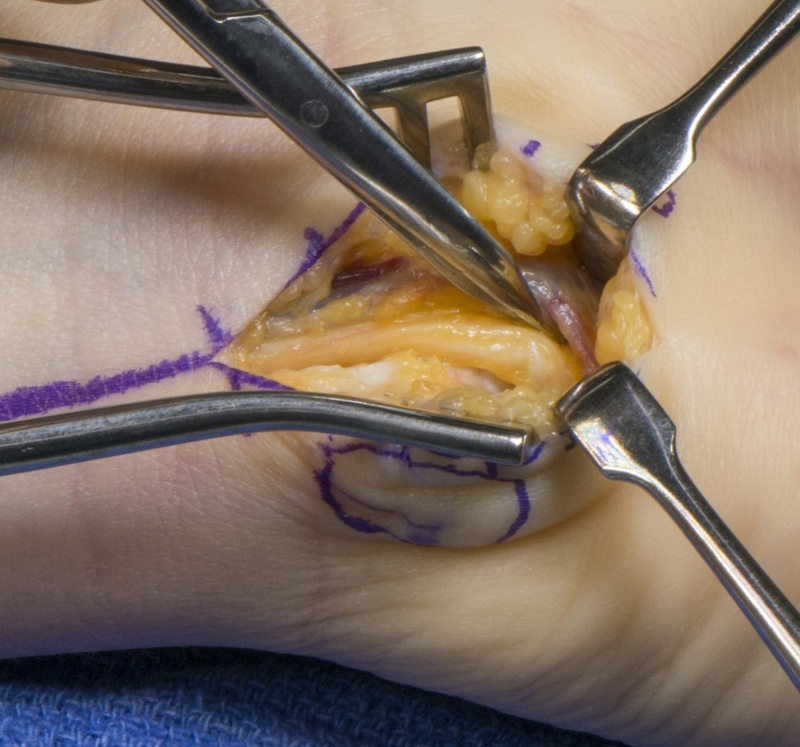 Learn the Guyons canal release surgical technique with step by step instructions on OrthOracle. Our e-learning platform contains high resolution images and a certified CME of the Guyons canal release surgical procedure. The ulnar nerve and artery pass through Guyon’s canal to the hand. The canal lis superficially on the ulnar palmar side of the wrist and is bordered ulnarly by the hypothenar eminence. The ulnar nerve is vulnerable to trauma at the wrist level. Compression of the ulnar nerve at this site is rare and can be associated with tumours or ganglion swellings arising from the piso-triquetral articulation. A well-developed palmaris brevis may contribute to compression. thickening of the fascia at the distal forwarm can be associated with distal ulnar neuropathy as the nerve crosses the wrist crease to the hand through the start of Guyon’s canal. The motor branch passes deeply into the hand and courses around the hook of the hamate where it is vulnerable to injury. Symptoms of ulnar nerve compression at this site may be both sensory and motor depending on the site of compression. Functionally there are 3 zones to Guyon’s canal. Zone 1 includes the main motor and sensory ulnar nerve proximal to bifurcation; zone 2 the deep ulnar nerve exits to pass around the hook of the hamate; zone 3 the ulnar nerve superficial branch is at risk of compression superficially in the palm.